有可能养一只熊猫作为宠物吗? [美国媒体] Is it possible to keep a panda as a pet? Isit possible to keep a panda as a pet? I guess the firstthing you should know is that China owns all pandas on earth. The pandas yousee in zoos of other countries are all lent from China and only for a certainperiod of time. Thecost of having pandas in those countries is stunning. 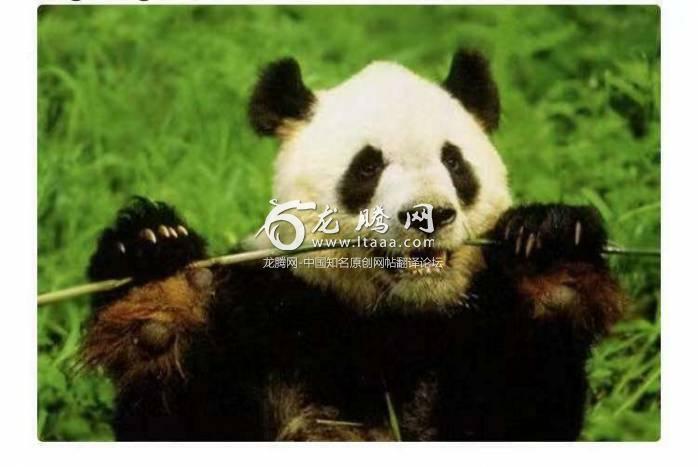 The Chinese governmentcharges 100 million RMB per year, let alone the high spending of keeping apanda. You have to build bamboo forest and hire panda experts so that thepandas can survive. Whenit comes to the mating season, the giant panda will paint secretions of theperianal gland on the post, the stump, the wall, etc. When come back home fromoutside, be ready to be welcomed bu those strange flavors. Soit may be a good idea to just have a look at this cute animal from time totime. Sawthe picture? Not very pleasing jaws either huh? The jawbones and molars ofPandas are really strong, so that they can crush the bamboo in their mouths.Take out a second, and imagine, how effective would they be on bone and flesh?Quite a scary thought, nonetheless, all that glitters isn't gold, and thepandas, in the end, might not be so friendly and adorable after all. Moreover,Pandas generally like to live in solitary confinement. This is pretty much thereason why you will never find a group, or a herd of pandas ever. They don'tlike company from their own crowd, so would they like you? If I were you, I'dreckon they wouldn't!! And,as Mercedes Lackey always says, you need a vet within 45 minutes. So I’d haveto go back to school, get a degree in biology, get admitted to veterinaryschool, and become a veterinarian. Figure 6 years for all that. OnceI had my Giant Panda, I know I could play with him. When they are being raisedin sanctuaries, the trainers don’t want them to become comfortable aroundhumans. so the trainers always dress in Panda suits, and soak themselves inPanda pee. It would be totally worth it to play with a Giant Panda. I guess Ibetter get at least 2. MercedesR. Lackey, Owned by 12 parrots, a Starling, 4 Cats, 6 Peafowl. OriginallyAnswered: What do I need to do to keep a Giant Panda as a pet? First,you need to be a Super Villain. Since Giant Pandas are heavily protected, onlya Super Villain would be able to either (a) steal one from a zoo or (b) poachone from the wild. Althoughthis is not strictly necessary, since Pandas are not entirely a solitaryspecies, and anyway Baby Pandas are the most kawai things in the universe andyou’ll probably want to have some on hand at all times, you’ll want a CloningChamber. This will allow you to continually replace your Giant Panda at will. Youwould want the Private Island and the Cloning Chamber, and not have to gothrough the Great Panda Heist. You could, without fear, get cell samples fromevery captive Giant Panda known, using your Loyal Henchmen and forgedscientific credentials. Then you could clone yourself an entire zoo full ofGiant Pandas. While this act might seem to put your status as a Super Villainat risk—after all, by doing so, you would be preserving the species againstaccident or a Panda Plague—you can retain your status by never allowing anyoneelse to enjoy your Panda Paradise, seeing and cuddling adorable baby Pandas, oreven allowing anyone but the Panda Keepers and you inside it. And those, youwill have rendered mute and illiterate in order to keep Panda Paradise asecret, which is, after all, the proper Super Villain thing to do.